Removing invasive species may include manual, mechanical, or chemical methods. Manual and mechanical methods involve physically removing plants from the environment through cutting or pulling. Chemical methods use herbicides to kill plants and inhibit regrowth. The technique and chemical used varies with the species. Several techniques may be effective in controlling a single species. Regardless of the method selected, it is very important to minimize the impact on non-target species and the environment. 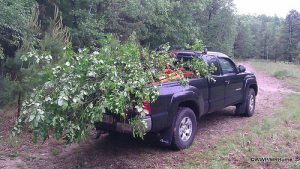 When removing invasive plants, special consideration should be paid to their disposal. A collaboration of the Connecticut Department of Energy and Environmental Protection and the University of Connecticut produced a useful information sheet (listed below). Pull seedlings and small or shallow-rooted plants when soil is moist as soon as they are large enough to grasp. Remove the entire root, since root fragments may re-sprout. Dig out larger plants (up to about three inches in diameter) with a Weed Wrench™, Root Jack, or Root Talon. 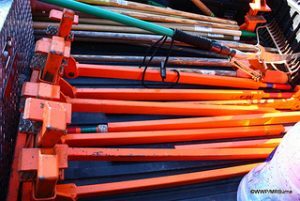 These tools, are designed to remove the aboveground portion of the plant as well as the entire root system. If vines are growing up trees, cut the vine at the base of the tree and at shoulder height and remove the vines from that area. Then remove a swath around the base of the tree. The vines above the cut area on the tree will eventually die and fall off. Suffocate small seedlings and herbaceous plants – place a double or triple layer of thick UV-stabilized plastic sheeting over the infestation and secure the plastic with stakes or weights. Leave the plastic in place for at least one year. For trees, cut through the bark and growing layer (cambium) all around the trunk, about 6″ above the ground. This technique is called girdling, and starves the tree of the water and nutrients that it needs to survive. Girdling is most effective in spring when the sap is rising, and from middle to late summer when the tree is sending down food to the roots. Remove suckers or new growth. To prevent the spread of seeds, cut off flowers and/or seeds or fruits before they ripen, and dispose of them in heavy garbage bags. Mow or cut back the plants at least three times a season to deplete plants’ store of nutrients, reduce seed formation, and kill or minimize the spread of plants. Each time you cut the plant back, the root system gets slightly larger, but must also rely on its energy reserves to push up new growth. Eventually, you will exhaust these reserves and the plants will die. For trees, cut down, grind out the stump, and remove suckers or new growth. Using a contact (non-systemic) herbicide will usually not kill well-established (deep-rooted) plants. A systemic herbicide is often necessary to achieve adequate control of troublesome invasive plants. Systemic herbicides absorb into the plant foliage and/or stems, then move and accumulate to toxic levels in the growing points or roots. Herbicides should be used when the infestation cannot be controlled through other methods alone. Controlled burning may require a permit – check with your local fire department and Conservation Committee before you act. Perform controlled burning during the spring, and repeat over several years. Burning allows native vegetation to compete more effectively with invasives. 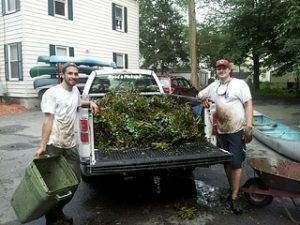 Proper disposal of removed invasive plant material is critical to the control process. 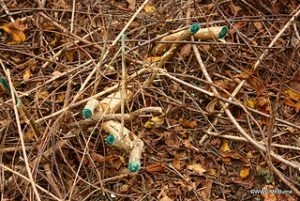 Leftover plant material can cause new infestations. In general, remove flowers, seeds, and fruits before they ripen, and place them in heavy black garbage bags 4 mil or thicker to prevent re-sprouting. On some plants, flowers can mature and set seed even after the plant has been pulled. Burn—Make a brush pile and burn the material following local safety regulations and restrictions, or haul it to your town’s landfill and place it in their burn pile. Burning should only be done with a burn permit from the fire department during the burning season. Pile—Make a pile of the woody debris. Cover the pile with a tarp held down with rocks. Periodically check the contents for signs of resprouting. Compost—Place all your herbaceous invasive plant debris in a pile reserved for invasive plants and process as compost. Monitor the pile for resprouts and remove as necessary. Do not use the resulting compost in your garden. Dry—Place woody debris on your driveway or any asphalt surface and let it dry out for a month. Place herbaceous material in a doubled-up black trash bag and let dry in the sun for one month. At the end of the month, the material should be non-viable and can be disposed of in the trash. These plants should ideally be burned or dried prior to disposal.